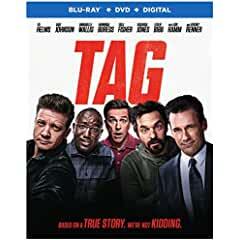 SRG Sites > NewTechReview > News > TAG arrives on Digital August 17 and on Blu-ray and DVD August 28 from Warner Bros.
TAG arrives on Digital August 17 and on Blu-ray and DVD August 28 from Warner Bros.
"Tag" will be available on Blu-ray Combo Pack, and DVD. The Blu-ray Combo Pack features a Blu-ray disc with the film and special features in hi-definition, a DVD with the film in standard definition and a Digital version of the movie. “Tag” will also be available on Movies Anywhere. Using the free Movies Anywhere app and website, consumers can access all their eligible movies by connecting their Movies Anywhere account with their participating digital retailer accounts. Fans can also own “Tag” via purchase from digital retailers beginning August 17.